SEE ALSO: WHAT MAKES A GREAT MEDIA ROOM DESIGN? When you’re at the local commercial theater, the first thing you notice is how comfortable the seats are when you first sit down – that’s where you’ll spending the next couple of hours, of course. The same luxury should apply to your own media room. There are endless selections of fabrics, patterns, and styles to choose from when it comes to selecting your seating. To prevent any sound-muffling, its crucial that your seat headrests – if you have them – are low and non-obstructive. That way, everyone in the audience can listen to exact same sound quality. It’s also best to place your seats in the “sweet triangle,” which is the space directly between the most left and right speakers. This will give everyone optimal hearing! So, which do you want for your media room – a widescreen TV, or a projector and screen combo? No matter which one you choose, you’ll certainly want to pick 4K Ultra HD resolution. If you’re afraid that your décor won’t blend well with your equipment, there’s no need to worry. Hidden technology allows you to keep both your aesthetics and functionality. Hidden projectors and screens can lower from the ceiling with a push of a button and then conceal themselves when not in use. This means you can decide how noticeable and seen you’d like your entertainment products to be at all times during the day. Give your media room the immersive sound quality it deserves! For your next movie night, make sure you have high-end performing audio that delivers exceptional sound quality. This means you’ll need to place your speakers strategically around your media room to create that ultimate surround sound layout. Just like with your screens and projector, there are hidden audio features you can install. In-wall and in-ceiling speakers are great for completely hiding away your speakers so that they aren’t noticeable at all. Bookshelf speakers are smaller, and they can blend in with your existing decorations – plus they can just fit nicely in furniture or shelves you already have set up! But for the best listening experience possible, standing speakers are the way to go. They also give any room a more theatrical and traditional look. Putting together the ideal media room design doesn’t have to be a hassle. Make it a breeze with these three necessary components. 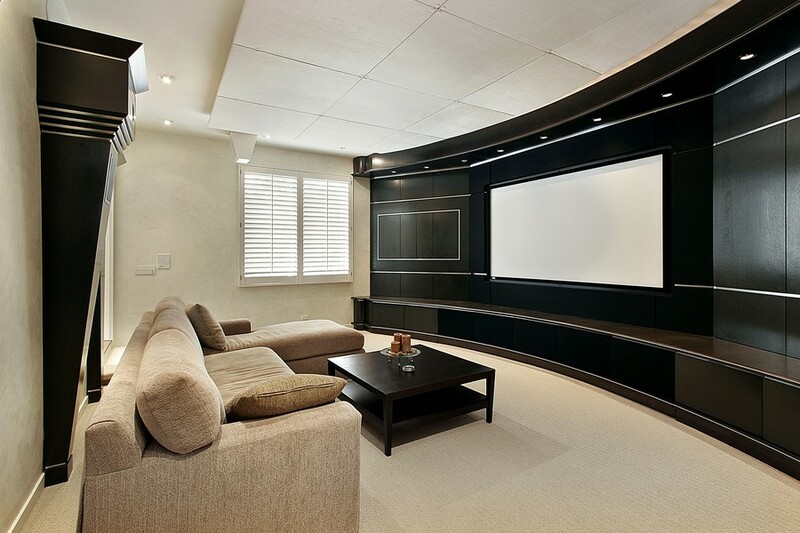 Want to learn more about our media room installation services? Give us a call or fill out our online contact form to schedule a no-obligation consultation. Our team would love to hear from you!